The Center for 17th- & 18th-Century Studies and William Andrews Clark Memorial Library are pleased to announce the appointment of Philip S. Palmer as Head of Research Services. 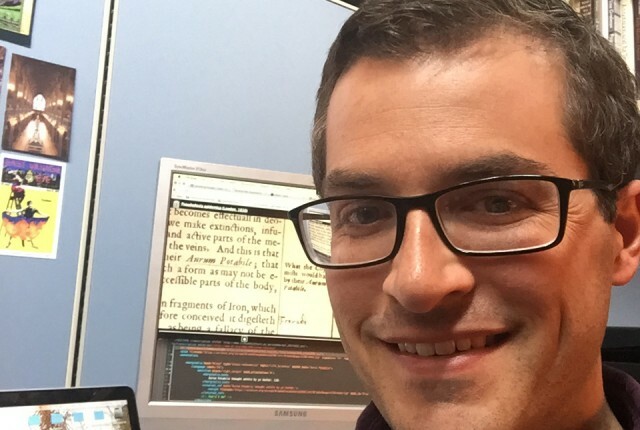 For the past two years Phil was the CLIR Fellow in Data Curation for Early Modern Studies at the Clark and has served as Interim Head of Reader Services for most of his tenure as a fellow. Phil holds an M.A. and Ph.D. in English from the University of Massachusetts, Amherst. After graduation, he was a visiting fellow at the Massachusetts Center for Interdisciplinary Renaissance Studies before coming to the Clark. He has recently completed an edition of excerpts from Thomas Coryate: Coryats Crudities is under contract with Broadview Press as part of its Anthology of British Literature Edition Series. Among Phil’s accomplishments these past two years are the completion of a survey of the Clark’s printed books to identify annotations and a pilot project with the UCLA Digital Library to digitize ten of the copiously or extensively annotated volumes. Phil has received two micro-grants from CLIR for projects related to transcription and marginalia, as well as a Director’s Scholarship to attend Rare Book School. In addition to coordinating visits and rare materials instruction for college and university classes—at both the undergraduate and graduate level—Phil is serving as co-principal investigator on a CLIR-funded proposal to digitize the Clark’s bound manuscripts and is the project director of an award from the Gladys Krieble Delmas Foundation to transcribe the ten annotated books digitized in the pilot project.